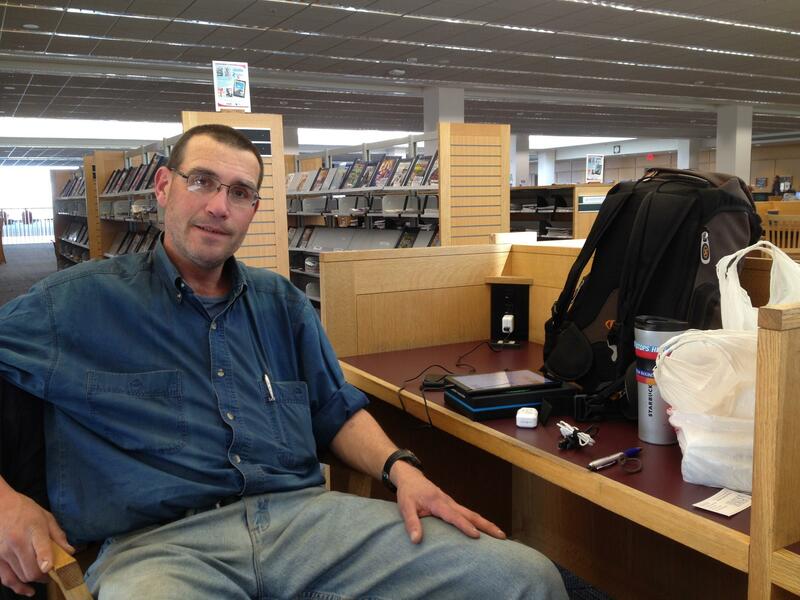 Jeff Keizer has been homeless since moving to Spokane four months ago from northern California. Tonight [Tuesday], we’ll air two hours of discussion about homelessness in Spokane. During the first hour, from 6-to-7 pm, Doug Nadvornick will talk with Spokane Mayor David Condon and Marty McKinney from the Truth Ministries shelter for men. Then, at 7, we’ll air the first hour of our homelessness forum, recorded last week at Spokane City Hall. Next month, the city is expected to release the results from its January homeless census, which was conducted in January. Past counts identified between a thousand and 1,500 people homeless at any one time in Spokane. One of them is Jeff Keizer. Keizer attended our homelessness forum and shared some of his story with one of our staff members. We followed up with him and he agreed to meet us at the downtown library to tell us more. Keizer came to Spokane about four months ago from northern California at the request of a friend who was living here and unhappy. “Actually, I wasn’t expecting to stay here. What I was expecting to do is get enough work to get the funding to take both of us wherever he wanted to go. So if he wanted to go back to California, I’d have to come up with about $400, which I can do in a week or two worth of work and still have enough funding for food or some of the creature comforts we all like,” he said. Keizer’s vocation is computers. He’s a technician. He’s done some temp work here. But finding it on a consistent basis has been hit and miss; more miss than hit, because of his lack of mobility. So Keizer has bounced from place to place. He stayed at a friend’s house in Airway Heights for a little while. And he’s gone from shelter to shelter, with mixed results. “I was effectively kicked out of the Union Gospel Mission, due to somebody’s false complaint. Without saying what it is, it was irritating because I know and anybody else who knows me knows it’s false,” he said. Keizer has had a backpack stolen, a phone stolen. He says the latter hampered his ability to find work through the temp agencies, which use apps to communicate with their clients. During his time here, Keizer has been learning the ropes in terms of finding places to stay and places to get meals. “Just getting, knowing exactly when and getting around can be a pain in and of itself,” he said. He hopes, with the weather warming, that he’ll be able to find more work and save enough money to go to Reno, where he has more of a support system and familiarity with the area. He thinks he’ll be able to find more permanent employment for himself and his friend. Throughout his time in Spokane, he says he’s tried to keep a positive attitude. “Maybe I’m different than most in doing so, but, you know what, it’s never done me wrong,” he said. Hear more of our conversation with Jeff Keizer on the Inland Journal Tuesday podcast, which will be posted this morning on iTunes, Google Play, NPR One and the Spokane Public Radio website.